← Seefood takes Wexfords biggest race for Hughes and Geraghty. Oscar takes the Open with doubles for Doyle, Elliott, James, Power and Purcell at Kilkenny Point to Point. What a Difference a Day Makes as Dinah Washington might say!!!!! The Kilkenny Foxhound meeting at Grennan Castle, Thomastown was held in pretty near perfect conditions with the scheduled six races being extended to seven to accommodate the one divide on the day. With the ground at the track described as good to yielding , pretty extraordinary when you think of it on the first Sunday of November, the 119 entries stood up well enough at declaration stage with 83 horses facing the starter. With Oscar Barton taking the Open under Tim Donworth and doubles for Gordon Elliott, Kieran Purcell, Paul Power, Sean Doyle and Rob James all adding to an enjoyable days racing. Racing was competitive with the eagerly awaited Ballygallon Stud sponsored Open Lightweight seeing a very strong field of 14 runners facing the starter for this three mile contest. With the Tim Donworth ridden Oscar Barton going off the 6/4 favourite, hopes were high that the Gordon Elliott trained 9 year old Oscar horse could add to his Loughbrickland win in October. Derek O’Connor was given the leg up on Sean Aherne’s admirable mare Isourbell with the 12 year old veteran leading them all for over two miles as the others jousted and scrimmaged in behind. The tight track and bends here might just lend itself to well balanced horses and front runners, with many horses finding it difficult to get into a rhythm. O’Connor and Isourbell put in some great leaps as O’Muircheartaigh, The Hollinwell and Boxing Along raced in behind. Eoin O’Sullivan and The Hollinwell were the first of these to give way as they struggled to jump with fluency and made some uncharacteristic mistakes. All the while Donworth was racing in mid division with Oscar Barton taking the lead after the fourth last. This move saw them stride clear and look like putting the race out of reach. One final challenge was thrown down at the last as the Ross O’Sullivan trained Dantes King came out of the pack to momentarily mount an effort. Oscar Barton still had 4 lengths to spare under the Co Limerick based amateur Donworth who must be looking forward to the rest of the season. Speaking afterwards Simon McGonagle representing the Elliott yard stated ” Sure they did it well. We will keep to Opens for the time being and look Hunter Chases in the spring” He did however confirm that the owners would be looking towards Cheltenham and Aintree as possible longterm objectives for the horse. The Co Meath yard of Gordon Elliott did double up on the day when the Charles Flattery owned and bred Miss Dinamic made a successful debut in the Eoin Doyle – Horse Trainer 5 and 6 Year Old Mares Maiden under Jamie Codd. This Kutub 5 year old mare had some reasonable bumper form to her name during the summer and once Codd pressed the “go” button no one could go with her. Connections indicated afterwards that the mare would try her luck in a Winners contest before going back to the track. Codds winner sees him join Derek O’Connor at the top of the national riders table on the 8 winner mark. The opening 4 Year Old Maiden sponsored by WP Mullins – Horse Trainer saw 12 runners try their luck, with Native Gamut very well supported in the betting ring for the Co Wexford based Monbeg Syndicate under Barry O’Neill. 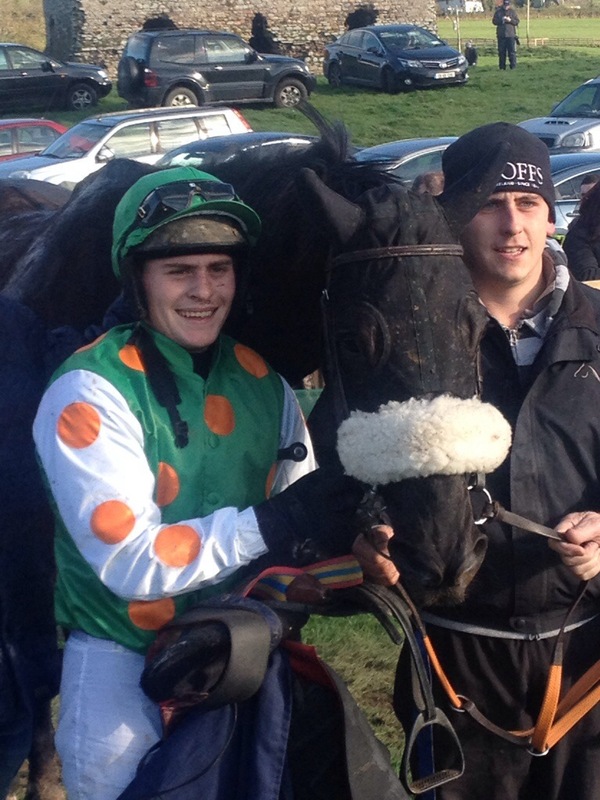 Their emerald green and orange colours did pass the post first but they were on Rob James who won on the Sean Doyle trained Black Sam The Man. Rob James pretty much nicked it on the line as he battled past Derek O’Connor and Ballywilliam who had been prominent all the way and looked a likely winner until James unleashed his mount. 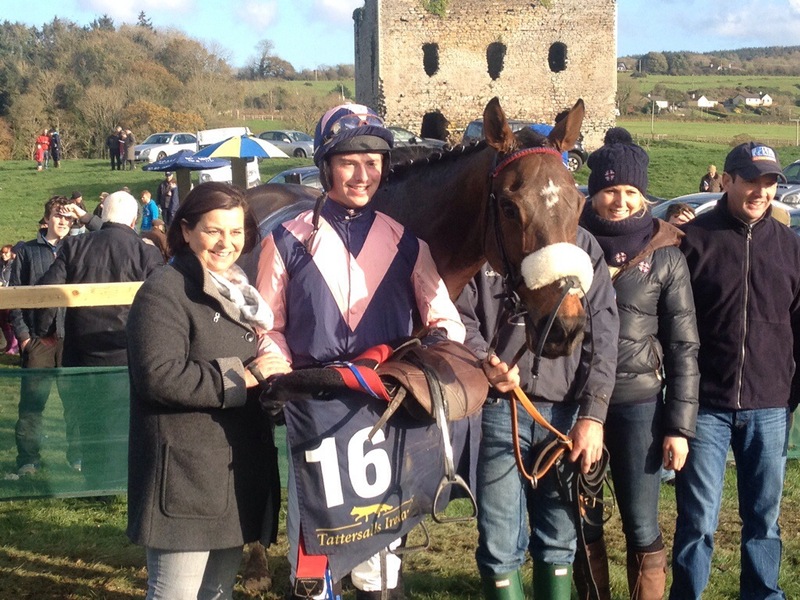 Co Wexford based Doyle and James doubled up in the second division of the Shark Hanlon sponsored 5 and 6 Year Old Geldings Maiden with Monbeg River. His fourth place at Tinahely proved his well being 3 weeks ago and he built on it here. The 5 year old son of Indian River came from off the quick pace set by Royal Haslar and Sage Monkey to win very easily. Kieran Purcell who trains near Windgap, Co Kilkenny was on the double at the track as well with Co Waterford based Declan Queally and Paul Power sharing the riding honours for him. Queally and Purcell took the first division of the Shark Hanlon sponsored maiden when winning with Bold Batchelor. This 5 year old son of Bachelor Duke was the favourite in the betting ring and sat in behind Glengra as that horse tried to lead all the way. Purcell gave Paul Power the leg up on Red Sunset in the Winners of Two with the Oscar 5 year old coming into the race two fences from the finish to pass the long time leaders All At Once and Subtitle. Power managed his own double on the day, with one win in the saddle and one as a trainer as his 7 year old Bakers Street took the concluding Friends of Thomastown GAA Older Horses maiden.